After swimming, surfing, snorkeling, and sailing the day away in Waikiki, not to mention hiking up Diamond Head Crater, reward your sore muscles with much needed soothing and comfort in these full service spas. Here are our top picks for indulging, renewing and rejuvenating your body and mind island style. The SpaHalekulani pampers you with their legendary service, all natural ingredients like coconut and hibiscus and Polynesian inspired treatments like the Samoan nonu massage. At the Hilton Hawaiian Village's Mandara Spa grab your special someone and indulge in a couples massage. Lastly at the Hyatt Regency be enveloped in luxury at the Na Ho'ola Spa and experience why Travel and Leisure named them one of the best spas in the world! The Abhasa Spa at The Royal Hawaiian, a Luxury Collection Resort is Waikiki's Premier Garden Spa. Ranked 2nd in the exclusive "Spas of America Top 100 Spas of 2015", you will find your sanctuary in our spa garden oasis where you may choose to be pampered under tropical trees and plants ~ it's a "shade better" than the rest. Abhasa, which means "illusion" in Sanskrit, is noted for being the only spa on O'ahu that offers luxurious spa treatments in a serene tropical garden setting, while located in the heart of Waikiki inside the world famous Royal Hawaiian Resort. Indulge in a variety of treatments from classic to local massage styles, traditional to tropical facials, body wraps and cocoons, nail and hair salon services, and more. For the ultimate spa experience guests can try a Hawaiian-inspired massage, followed by a facial treatment. The Royal Hawaiian Resort is home to the Abhasa Spa, a sophisticated and inviting retreat that effortlessly blends the traditions of the past with an array of cutting edge amenities. The spa backs onto the tropical gardens of the resort’s historic grounds, taking full advantage of the immense beauty of the lush, tropical gardens. Inside both single and double cabanas, treatments are delivered from expert hands while giant birdbaths just beyond the rooms lure the island’s myriad breeds. We recommend a traditional massage, followed by a cocooning treatment for the ultimate spa experience. The cocoon—a type of hydrotherapy—wraps guests in a warm sheet, then gently lays you down on a soft mattress filled with body temperature water. While you remain dry inside of the cocoon, the gentle pressure of the water is both healing and re-energizing. 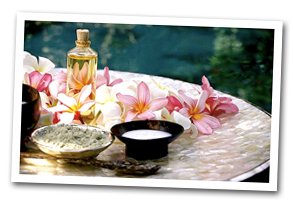 Lomi Lomi, a rhythmic Hawaiian massage, is a highlight of our extensive spa menu. Combined with Pohaku, the application of hot stones, the result is deeply relaxing and invigorating. In keeping with the fragrant surrounds, essences such a coconut, hibiscus, jasmine and lavender, as well as kukui nut oil and papaya pineapple scrubs, are used as part of most treatments. Abhasa, Skin Ceuticals, and Epicuren products also enhance many facial and body care experiences, while the luxurious Almena line is used during each hair care appointment. Before you begin your journey in one of our nine treatment rooms or four outdoor cabanas, take full advantage of the steam rooms, Jacuzzi, and complementary aromatic tea. Changing rooms are available for your convenience. Contact the concierge to reserve your preferred timeslot. Gray's Beach, which fronts Halekulani, was known to early Hawaiians for its healing waters or Kawehewehe. The healing tradition of this beach continues today with SpaHalekulani, the first spa to fully explore the cultures of the Pacific Islands, including Samoa, Tonga and Tahiti. The spa's authentic treatments, which use only fresh island ingredients, such as coconut, orchid, hibiscus, seaweed and papaya. All of the spa's massages, body treatments and facials begin with a ritual foot pounding, with puili sticks (bamboo shafts used in hula dances) an exotic way to treat neglected feet. Afterward guests can indulge in Ton Ton Amma, a Japanese massage performed with rubber-headed mallets and named for the sound these make on your back, or the Polynesian Nonu massage, which kneads out knots using hot rocks applied with a deep, fluid motion. In addition to traditional Swedish and shiatsu massages, Samoan-inspired nonu and Hawaiian lomi lomi, hapai and pohaku massages are offered. Therapists will even customize a massage based on your needs and preferences. Facials are individually crafted for specific skin types, and the body scrubs and wraps come complete with a steam shower and a mini massage. In keeping with Halekulani's tradition of serene accommodations and trademark hospitality, SpaHalekulani provides guests with a unique, all-enveloping spa experience. The goal is to create a new, positive sense of well-being on the outside that also permeates within. The end result is a respite that is cultural, emotional and spiritual, and it is accomplished only through the entire staff's commitment to the tradition of hospitality and timeless grace that is Halekulani. A full menu of massages, body and facial therapies, and hair and nail care services are also available to guests. The spa features seven relaxation suites, including two tandem suites for couples, one of which can be transformed into a bridal room. Plus, there are steam showers, therapy beds, personal lockers, private restroom facilities and an outdoor relaxation area. SpaHalekulani was recently honored with the coveted Mobil Four-Star rating, the highest bestowed in the Mobil Travel Guide, "America's Best Hotel & Resort Spas." 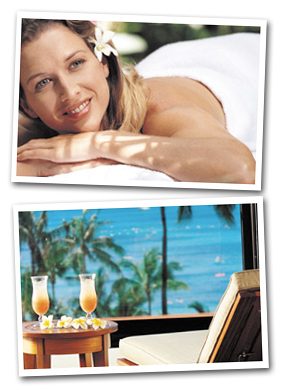 Mandara Spa, boasts the largest spa in Waikiki, provides one of Hawaii's most beautiful and complete spas. Upon entering the Spa, you'll be transported into a world of relaxation and rejuvenation with a host of spa treatments that incorporate Hawaiian, Asian, Western, European and Polynesian beauty and relaxation concepts. Mandara Spa offers exquisite Balinese-style service, as well as Asian spices and oils for masques, scrubs, wraps and other treatments. You will also be able to experience massage styles ranging from Swedish to Hawaiian lomi lomi as well as Mandara's trademark Mandara Massage that features two therapists working in unison for the ultimate pampering experience. For honeymooners or couples on a romantic escape to the islands, Mandara Spa also features lanai and spa suites for duet massages, body wraps, and other treatments couples may undergo simultaneously. Mandara Spa also features a state-of-the-art Cardiovascular Fitness Center open to all guests for a nominal fee. After your workout, enjoy your cooldown in the relaxation area adjacent to the locker rooms. This Waikiki spa features 10,000 square feet of pure luxury with amazing views of Waikiki Beach. It's no wonder Travel & Leisure Magazine named Na Ho'ola Spa one of the top 10 spas in Hawaii and one of the top 100 spas in the world! 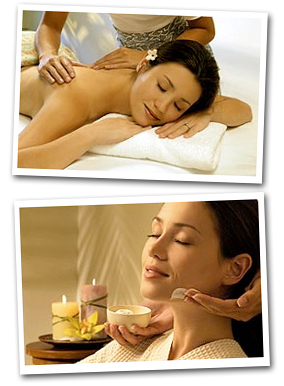 The spa offers a variety of treatments for the face and body, many of them utilizing Japanese or Hawaiian methods. About two dozen luxuriant treatments and services are offered, ranging from a relaxing poolside massage to a seaweed body wrap. Choose from a variety of massage, skin, body or beauty treatments - then relax in our exquisite facilities including 19 treatment rooms. From the relaxation room to the couples suite, the facilities are fully equipped with all the latest spa amenities and provide a comfortable atmosphere for your treatment of choice. After a couple of days of sun and surf, you'll be ready to spend time being pampered by the Kalo Package, a nearly five-hour process that includes a jet bath, a body wrap, a 50-minute massage and a deluxe facial. Women can end things with makeup application.